A second Societe Generale employee has been arrested as part of the inquiry into an alleged rogue trader scandal at the bank, judicial officials say. The bank confirmed that police had searched its trading floor and held one person for questioning. Societe Generale said the employee was a cash equities broker, but declined to name the individual. 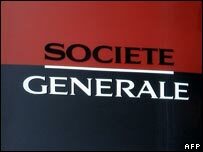 Societe Generale announced 4.9bn euros ($7.6bn; £3.8bn) of losses, which it blames on its trader Jerome Kerviel. This person has not been named, but is understood not to be the broker from the bank's Fimat unit - now called Newedge - and who was questioned and since named as a witness. Mr Kerviel is being investigated for breach of trust, computer abuse and falsification. He has previously said that he refused to be made "a scapegoat". He is due to appear in court on Friday in an attempt to secure a temporary release while the investigation continues. Mr Kerviel has previously said that he was acting alone, but insisted that his bosses ignored his huge trades as long as he was making a profit. The latest arrest came as a US-based law firm said it had filed a class action law suit against the French bank on behalf of holders of SocGen's US-listed shares. It alleges that Societe Generale misled investors about exposure to the sub-prime mortgage market, and failed to act on information about trades by Mr Kerviel. An internal inquiry at the bank found that it lacked controls that might have prevented the trader building up 50bn euros of unsupervised bets on European share prices. The bank's 2007 profits fell 82% from 2006, mainly due to the losses incurred by Mr Kerviel but the bank also suffered some losses related to the sub-prime crisis. Did one man cause mayhem? What is a City trading job like?